The Santaco Express airline is a proposed new low cost carrier operating a daily flight to Johannesburg, Bhisho (in the Eastern Cape Province of South Africa) and Cape Town. 11 Nov 2014. Santaco, the South African National Taxi Council, still have plans to launch its low cost airline off the ground despite the financial problems that they have been having. The council launched their low-cost airline in 2011 with a publicity flight but they have not been able to launch any commercial flights because of a lack of funds. The airline plans to enter the market in the middle of 2015 after they have raised the R200m they need to operate at least two aircraft. The airline will be focusing on flights to and from the Eastern Cape. They plan to launch flights from Lanseria to Mthatha, Bhisho, Cape Town and back. Santaco say that flights will be operated initially by Air Aquarius, who will be supplying two 120-seater aircraft as well as the necessary crew and aviation licences. 17 May 2013. Santaco Spokesperson Phillip Taaibosch is interviewed by SABC news (starts 1 minute and 54 seconds in the clip): "Whether it's in a year, whether it's in 2 years, but the aeroplane of the taxi industry is going to be a reality and it will be in the air". 14 Aug 2012. It's reported that Santaco Airlines' Chief Executive, Nonkululeko Buthelezi, says that Santaco Airlines hopes to commence flights in July 2013. It's reported that Santaco has failed to reach an agreement with Standby Travel, a company it planned to take control of for operations purposes. “Our plans are still on track, but we have to recalculate because of the (economic) downturn that saw rising fuel prices and airport taxes.” said Vernon Billet, Santaco's Western Cape Chairman. “We intend to launch before the end of the year, but right now we are taking a step back and monitoring the market. When we launch, we want to ensure that we will run a sustainable business.” says business development officer at Santaco Airlines, Nkululeko Buthelezi. Thabisho Molelekwa, Santaco Airline's spokesman says: “We could not launch the airline before the festive season as promised but we are doing everything we can to launch by Easter." Philip Taaibosch, Santaco's general secretary that Santaco were in the process of buying a "big and reputable airline": "The negotiations to buy the company (which I cannot mention now) are at a very sensitive stage. We have applied for the licence and it could be issued between the middle of January and early February. For now we are completing negotiations with a big and reputable company to buy it. Once the deal is completed and the date announced for the issuing of a licence, we can then start selling tickets." Santanco Airlines takes to the sky for the first time with a flight from Johannesburg Lanseria airport to Bhisho Airport, and at the same time announces that it is also planning to launch a bank and a boat! The first Santaco aircraft is a Boeing 737 with a maroon striped over a white body. The first flight was overbooked, on board being President Jacob Zuma, Gauteng MEC for Roads and Transport Ismail Vadi, Transport Minister S’bu Ndebele, Eastern Cape Premier Noxolo Kiviet, other Members of Parliament and Santaco bosses. As the dignitaries seated themselves across the PA system came the announcement: "Welcome aboard Santaco Airline, our Zola Budd, and this is your Captain Dudly Snell and I hope you enjoy your journey to Bisho with me." As the plane took off there was clapping and singing of 'Shosholoza'. During the flight a ten rand note was passed from the back to the front, as is done in taxis. Today is a historic day for our country. When addressing a black business summit last week, I said we need to start seeing tangible results of economic transformation and freedom. We said black people, women and persons with disabilities need to visibly enter the economic sectors that were closed to them before, such as manufacturing so that we could see the rise of new black industrialists. Today we are celebrating such an achievement. A sector that was branded by some as never going to be able to progress to even own fleets of buses, has leapfrogged into the aviation industry by owning an airline. It is therefore an honor and a privilege for me to join SANTACO in celebrating this milestone. SANTACO is also celebrating ten years of existence within the taxi industry. You have achieved in 10 years a goal many would take a lifetime to reach. We are happy that our freedom and democracy creates an environment for South Africans to literally touch the sky when they want to! We applaud SANTACO for this brave step, in giving the country its first fully black owned airline. This comes so soon after the welcome involvement of the taxi industry in the ownership and operation of the BRT, another important empowerment initiative. The SANTACO Airlines venture is also significant because it is a practical example of economic and social emancipation, in both ownership and consumption. SANTACO Airlines is owned by more than a hundred thousand taxi owners, which makes it one of the most broad-based black empowerment ventures in our country. Secondly, a significant number of our people who relied on taxis and buses only, will now be able to access SANTACO airline services between Johannesburg, Cape Town and the Eastern Cape. Currently, ACSA airports around the country handle more than 18 million passengers per year. While this number might look big, most of our people do not have access to air transport. This is because of the high cost of air travel, and to some extent, an unfortunate perception which should be shed, that air travel is the exclusive preserve of a privileged few. SANTACO is therefore opening air travel to the masses, building on the contribution of other low cost airlines that entered the market recently. This new entry underlines the growth of our aviation industry. Statistics show that South Africa is home to more than 70% of aviation activities in the SADC region. In addition, the country's aviation industry has experienced significant growth over the past 10 years. For instance, in 1993, fewer than 12 international airlines flew into South Africa. To date more than 70 international airlines fly into the country on a regular basis. Passenger numbers have been growing more than 10% per annum. The Airports Company of South Africa handles close to 16.8 million departing passengers annually, and is currently experiencing an annual growth of 10.8 percent. The East London airport, where SANTACO flights will be servicing, has grown by 18 percent on average, reaching more than 700 000 passengers per annum. It is also correct and proper for the taxi industry to move a step higher into the aviation sector. The industry is a major player in the public transport industry, carrying an average of 15 million passengers a day countrywide. It is by far the single largest and most accessible service provider in the public transport industry. Annually the industry spends 15 billion rand on fuels, 10 billion rand on vehicles and 150 million rand on tyres. It contributes about 16, 5 billion rand in revenue every year. To support the growth of the taxi industry and of public transport in general, as government, we will continue to invest in infrastructure, especially the building and repairs of roads. We have already spent more than nine billion rand rolling out the Integrated Public Transport Networks in some of our cities over the last six years. The expenditure trend is going to continue for the next 10 years. Over the past six years, we invested more than 48 billion rand in our Bus Rapid Transit System, rail and the Taxi Recapitalization Programme. Today we are also upbeat for another important reason. For many years, the taxi industry has been shrouded in controversy. It has been faced by violence, poor service and a bad safety record. The industry is steadily shedding the negative image, which augurs very well for the future growth and development of this important transport sector. Through your TR3 2020 Strategy, SANTACO, which involves Redefining, Restructuring and Repositioning the taxi industry, we anticipate much more developments. These developments encompass both tangible outcomes such as safe taxis, as well as intangible outcomes such as embracing good customer client attitude and relationship, resulting in world class service. In this regard, I am happy that we share the commitment to improving the transport system in the country and in particular the services provided by the taxi industry. Government, through the Department of Transport is committed to setting up new academies to train taxi drivers. About R5 million was allocated towards this project. Many more areas of cooperation will be explored in future. All the positive developments we have spoken about indicate that the taxi industry is moving forward towards the development of world class public transport in South Africa. Your motto: "A backward glance with a forward outlook" is hopefully a true expression of the good intentions that propel you in this industry today. With our success in hosting the World Cup Tournament last year, we believe that the taxi industry is also fast gearing up to play a significant role in the many world class events that we will still host in future. In conclusion, as I said, the launch of the airline is both an achievement and a challenge, and hopefully an indication of many innovative projects still to come. May the SANTACO Airlines bring pride and hope to the millions of South Africans, as your slogan boldly suggests, "Fly with Pride." We welcome this launch wholeheartedly, and wish you success in this first endeavor. This should pave way for your intended expansion to other routes, including the broader SADC region. May your initiative encourage more exciting groundbreaking ventures into new sectors of our economy, by many black entrepreneurs. In this way, we will be achieving the goals stated in 1955 in the Freedom Charter, that all shall share in the country's wealth. A Santaco "negotiating team" gets together at the Chrystal Towers hotel - Nkululeko Buthelezi, Danie Coetzee, Bongani Msemang, Mpho Mashinini, Jothan Msibi, AJ Mthembu, Wilhelm Smith and Philip Taaibosch. Santaco runs a competition to name their airline: "Do you have the perfect name for the new Santaco airline? Simply SMS "SANTACO", your name and your suggested name for the new airline to 34036. You stand a chance to win one of the 5 weekends-away at a Protea Hotel. Even more, there are also 10 VIP invitations to the launch of the Airline in September that are up for grabs. SMS costs R2, free SMSes don't apply, Terms and conditions apply". The South African National Taxi Council (Santaco, which represents 95% of taxi operators in SA) made their initial announcement on the 29th June 2011, and said that the official launch is planned for the 16th September 2011 (Santaco's 10th anniversary, and the plan was to fly members from Lanseria to Durban) when tickets would start being sold, and it was planned for the airline to start flying commercial flights in November 2011 (presumably in time for the December holidays). Arthur Mthembu, the president of SANTACO, claims to have one morning woken up with the idea fully formed in his head: "I conceived it, I gave birth to it and now I have nurtured it." "Flying still remains largely for white people. It is not because black people cannot afford flight fares, but the issue is how to get there (airports) if you don't have your own car. Metre taxis are very expensive. Our airline cost will have a flat fee structure, which will range between R500 and R600." said Jabulani Mthembu, the President of Santaco, yesterday. "To strategically exploit various gaps within the South African travel and leisure industry in order to reduce costs and in so doing, attract a different, new and previously excluded passenger - which in turn will introduce a new breed of local and international traveller to the airline market – and so becoming the first choice airline in South Africa for the masses." Having previously operated in Iraq, AirQuarius aviation are the perfect partner for the taxi council. 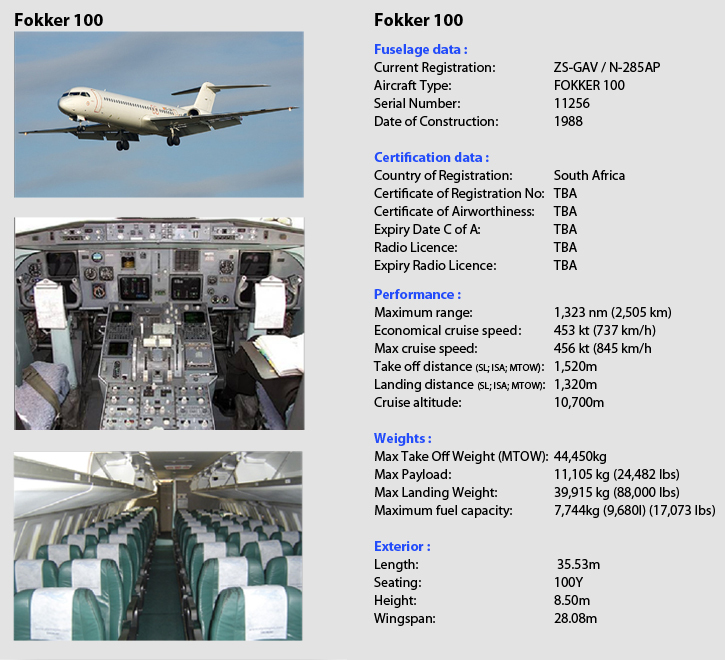 The plan is for 100-seater aircraft (this probably implies that they plan to use AirQuarius's Fokker 100 jets which can seat up to 107 people) to initially be supplied and operated by AirQuarius Aviation (who have the crew and aviation licences), who would transfer skills to Santaco over an 18 to 24 month period. AirQuarius is the holder of a valid part 121 Operating Certificate issued by the South African Civil Aviation Authority, a scheduled and non-scheduled air service licence (Number S714D and N713D) issued by the Air Service Licensing Council in terms of section 17(1) of Act 115 of 1990 as well as an International Air Service License (Number I/N 134) issued in terms of 18(1) of Act No 60 of 1993. A few years ago it was announced that AirQuarius would operate flights on behalf of Airtime Airlines, which never got off the ground. Santaco has set up a subsidiary, Santaco Travel Ltd, which will own Santaco Airline. Santaco Travel Ltd is in the process of raising some R67m to capitalise Santaco Express Airline, which will initially operate a single airline flying between Johannesburg, Cape Town, and Bhisho. In the first phase shares will be sold to Santaco's members. “Our members are buying shares and we are still negotiating with other investors. We didn’t take a bank loan and government is not our investor,” said Nkululeko Buthelezi, Santaco’s business development office. In the second phase, private investors may purchase shares (strategic investors will be announced in September). The third phase involves listing the airline on the Johannesburg Stock Exchange. A Santaco document reads: "Our listing will make us the broadest-based black economic empowerment organisation in SA, with many previously dis- advantaged persons owning shares in the company." Santaco Travel might add another aircraft in December, depending on demand. 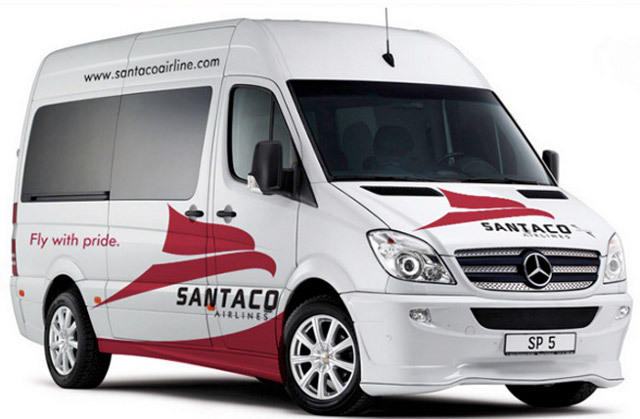 On 27 October2010 Santaco Trading (Pty) Ltd took ownership and control of Standby Travel Ltd, a public company, whose aviation model is the registered vehicle being used to launch Santaco Airlines. Directors are Alan Dickinson, Mpho Mashinini, Jothan Msibi, Pieter Pieters, Phillip Taaibosch and Kobus van der Merwe. The Executive are Nkululeko Buthelezi (CFO), Danie Coetzee (Strategic Officer), Alan Dickinson (COO), Bongani Msimang (CEO) and Kobus van der Merwe (IT). A differentiating feature of Santaco Express, is that it plans to pick up passengers at taxi ranks, who would then travel to the airports, fly to the following airport, and then offer a taxi service to their destination taxi rank. They plan to run shuttles to the airports from Johannesburg's Park Station, Bosman in Pretoria, Bellville near Cape Town and Mdantsane in the Eastern Cape. Nkululeko Buthelezi, Santaco’s business development officer, said: "We want to call our model a door-to-door service. You’ll leave your house and walk less than a kilometre, find a taxi and go to Park Station. When you get there, you decide that you don’t want to be on the road for 14 hours, or you’ve got a bit of extra cash – this service is not aimed at taking business away from taxi drivers, it will be at a premium – and want to go to Eastern Cape on the flight, so you go to a [different] section of Park Station and are immediately issued with a boarding pass, your bags are taken and then you go through a security check - all in the taxi rank. Once you step into the airline section you’ll notice you’re in a different environment, from the level of cleanliness to the quality of service you’ll get. The decor. Everything. From there, you’ll be taken to Lanseria and you’ll be received by the ground crew and (board) the plane. When you hit the ground on the other side, you and your bags will be taken on a shuttle and to the taxi rank there, which will be a major hub we want to develop." 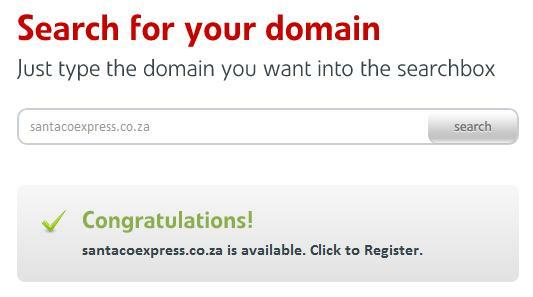 There was no website set up on 30 June 2011, and the url www.santacoexpress.co.za hadn't been registered! Very risky stuff! A cybersquatter's dream. Nkululeko Buthelezi, Santaco's business development officer, told reporters and potential investors in Johannesburg on the 29th June 2011: "I can see some of you rolling your eyes because of how our taxi drivers drive... I can assure you we won’t allow our taxi drivers to drive [the aircraft]. We specialise in awkward areas because that’s where our business is. We will be building everything into one price in the affordable sector." "Santaco's customers frequently have to endure long taxi trips to Bisho, and the organisation is therefore looking at routes such as Bisho to Johannesburg Lanseria Airport. The plan is to initially fly from Johannesburg to Bisho and then onwards to Cape Town. “We will not risk people’s lives. To prove that, soon after the launch our 2 500 delegates will be ferried by our very own aircraft around the country. So if anything has to happen it will affect our delegates first,” said Nkululeko Buthelezi, Santaco's business development officer. Linden Berns, an airline expert, was quoted as saying: "They would need to finesse their business plan in terms of which airports they would be flying from, and which aircraft they would be using...No airline made a profit in the first year to three years. 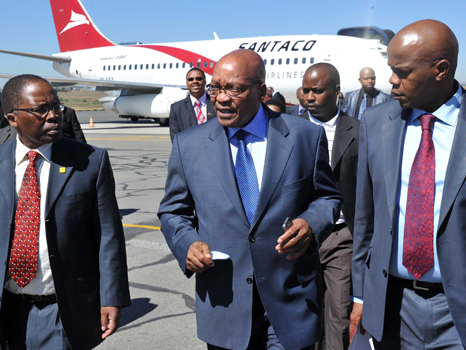 They need to have deep pockets, but it can be done...There are airports at Mthatha and Mafikeng, so why not use them?" Nico Bezuidenhout, the Chief Executive Officer of Mango Airlines, said that "Mango welcomes any initiative that could make air travel more affordable for South Africans." The large number of Mango's passengers who are first-time flyers indicates "a significant market with growth potential for affordable air travel in SA". The spokesman for Mango Airline, Hein Kaiser, said that "Aviation is a challenging industry with many variables, including the weather. However, a true low-cost business model in a market in which there is sufficient demand, has strong commercial potential. A large number of our guests on board have been, and are, first-time flyers, indicating that there is significant market with growth potential for affordable air travel in South Africa." Transport Minister Sibusiso Ndebele has welcomed the South African National Taxi Council's (Santaco's) announcement that it will be launching a low-cost airline. "We have repeatedly been asking, where are Blacks and particularly Africans, located in the mainstream economy of our country? We have constantly maintained that the taxi industry, which is Black-owned, controlled and run, cannot forever remain at the margins in economic terms," said Mr. Ndebele. "The taxi industry is a key player in the economy of our country. We believe the taxi industry is a key player in the transport sector. This important industry will no longer be defined primarily by violence and disorder. "We must open the taxi industry to include activities beyond the running of a taxi to other benefits in the transport value-chain. The taxi industry must, therefore, access as many opportunities in the transport sector and in the broader economy of our country. We, therefore, welcome Santaco's announcement that it will be launching a low-cost airline. "Recent empowerment deals are testimony to the fact that real economic empowerment and transformation of the taxi industry is no longer merely a cliché but is fast becoming a reality. This includes the 7th February hand over to taxi industry shareholders Phase 1A Bus Operating Company of the Rea Vaya Bus Rapid Transit (BRT) system in Johannesburg. The value of the contract is approximately R184-million per year. "These and other empowerment initiatives within the transport sector indicate that we are certainly moving in the right direction towards ensuring that the taxi industry becomes part of the mainstream economy. Together, we are giving meaning to a future of peace, progress and prosperity for the taxi industry. Our common agenda is, indeed, to ensure the empowerment of our people. The BRT and other initiatives in the transport industry, including the provision of public transport as opposed to our current system of commuter transport which means up to 24-hour operations, can offer a significant entry point for the current taxi industry to become one of the most powerful players in our economy. The taxi industry must prepare to play a more meaningful role in the future. The taxi industry has more than 64% of our commuting services in South Africa. It is the biggest Black-owned industry. It is available in each and every town. "To this end, Santaco's TR3 2020 strategy for the redefining, restructuring and repositioning of the industry till 2020 is most welcome. A vibrant taxi industry that shares the vision of transformation in improving public transport, in addition to bus operators and passenger rail operations, is what is needed in our country. We have faith in the taxi industry. It is only through working together that our endeavour to implement our much needed integrated public transport networks can be achieved," said Mr. Ndebele. "Can you imagine planes carrying out emergency landings to pick up more passengers on route! or hanging out of the window shouting, JOBUUUUUURG! This would be more believable if it appeared on 1 April. They should sort their Taxis out first! if they can fit 30 people into a taxi, imagine how many they can fit into a plane! in addition to requesting window or emergency exit seats, you will be able to book tik, heroin, dagga and prostitutes! the pilots will have teardrop tattoos and the air stewards will have tattoos on their necks. love/hate tattoos on their fingers ... i love mom on their arms ... oh and no one will have front teeth. no one will dare complain about anything or they will be chucked out of the plane mid-air! oh my goodness, the possibilities are endless with such an airline! Four four asihlalisane jooo!!! This is scary. I wanda how many accidents are we going to have on air lol!!! and dont forget it mite break down in the air. Hmmmm think of the new plane signs,,kwakwakwakwa left thumb up Joburg. Is this going to be a METRE PLANE or FLAT FEE STRUCTURE?? these planes will be pimped out....rude logo stickers,loud house music....ghetto airlines"
Santaco's Investors Guide describes a "timeshare in the sky" service (Standby Airshare), where travellers could buy bulk international flight tickets at a discount of up to sixty percent of the current airfare: "R60000 buys the passenger 10 return business class tickets from Johannesburg to Mauritius, Valid for 10 years!" Owners of the standby airshare would be able to swap and sell their rights - "just like timeshare in the sky". Santaco are also considering buying distressed stock from other airlines - seats that have passed their sell-by date - and selling them on to their customers at discounted rates.